Hey guys!! I just got wind of the J.Crew Factory sale going on right now! It's their one year birthday and EVERYTHING is 50% off! Better news? 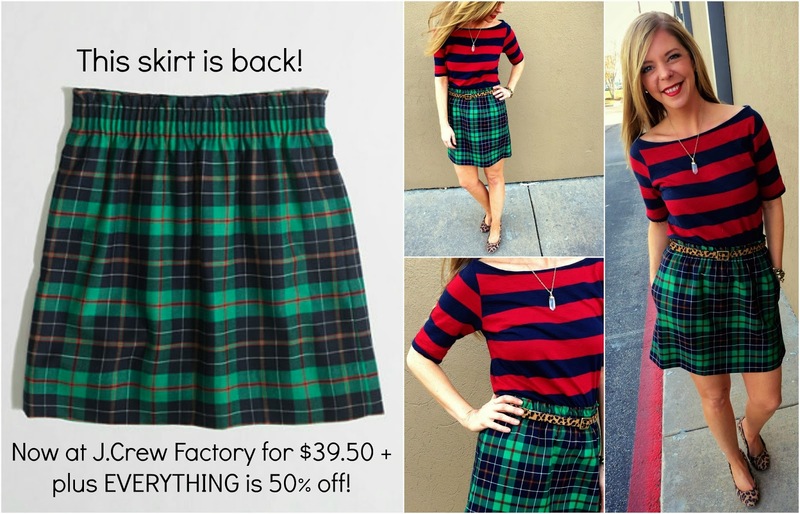 They have the tartan pleated mini skirt in stock from the retail store that sold out CRAZY fast last year. It's on sale for $39.50! This is a STEAL of a deal! You better run because I don't think this one will last long! While you are shopping make sure to check out a few of my other favorites: this bow sweater, a color blocked goody, a sequined beauty for less than $50 and this stripe infinity scarf!! Why does this month entail a shopping ban? Please go grab something so that I can live vicariously through you! Too bad I can't go!! I'm on no spend last month and this month except for 2 designated w/coupon special purchases at Old Navy and DSW. Shop your heart out for me!! That's awesome! I'm not super into J.Crew beyond their fab jewelry so I'm gonna give it a look! This sale is killing my credit card but my closet is super excited to add some fabulous pieces for Fall! I soooo want to drop some dough on that sale right now. That is my FAVORITE store and I can't wait to be able to wear their things again. The 50% off sale is the time of year when I stock up. I actually just got done placing a huge order with them! And I had that skirt in my cart (I took it out though, I had to start narrowing things down, I had WAY too much)! Yay! I'm obsessively looking at everything......it's SO tempting! OMG I so don't need to shop, but I sure want to! Why did you have to tell me about this AMAZING sale?! My wallet hates sales, and I love that skirt! I actually ordered the skirt yesterday and of course today it is 50% off lol...hope it looks as good on me as it does on you! What a cool idea for a giveaway! One of my best friends was diagnosed with breast cancer at 29. She's had quite the battle, but right now she's doing the best she's done in years. You've given me the idea to ask her to write a little something for the blog. Fingers crossed she will agree! Stunning post! So cool and inspirational!